Arlington, VA, April 22, 2014 – PBS KIDS has announced the launch of an all-new web-original property, PLUM LANDING, a cross-platform, digital adventure designed to engage 6- to 9-year olds in environmental science by using animated and live-action videos, hands-on activities, web games and an interactive mobile app for iPhone, iPad and iPod touch: Plum’s Photo Hunt. All of the PLUM LANDING resources, including standards-based tools for educators, are offered for free. Produced by WGBH, PLUM LANDING follows the adventures of Plum, a video game designer from the desolate Planet Blorb, who longs to experience nature. To realize this goal, Plum commandeers a space ship, zooms down to earth, befriends five eager kids—Clem, Oliver, Gabi, Brad, and Cooper—and launches them on missions as diverse as “find a lake in the desert!” and “search for a cow that lives under water!” Zeroing in on four ecosystems—the Australian desert, the mangroves of Belize, the Canadian Rockies and the jungles of Borneo—Plum discovers many fascinating, puzzling and profound things about Earth and uses what she learns to create explorer games for 6- to 9-year olds. On the PLUM LANDING website, kids can play these games and explore each of these exotic ecosystems. Plum also encourages kids to investigate their own worlds with Plum’s Photo Hunt App. Available exclusively for iPhone, iPad and iPod touch, Plum’s Photo Hunt App is an educational photo-taking and sharing app designed to motivate kids to go outdoors and interact with nature. The app challenges users with more than 36 different missions. Plum’s missions prompt users to explore nature and take photos of various outdoor discoveries. Families have the option to send photos of their nature finds to Plum for a chance to be featured on the PLUM LANDING website. The app also allows children to add “photo bombs” of the different PLUM LANDING characters to their pictures. Plum’s Photo Hunt is available for free from the App Store on iPhone, iPad and iPod touch or at www.appstore.com/PBSKIDS. 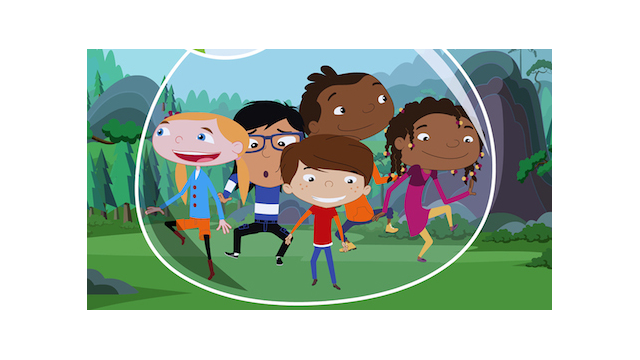 Helping to build awareness and excitement for the debut of this new science-based initiative, four of PLUM LANDING’s animated videos appear as on-air shorts between episodes of ARTHUR this week on PBS KIDS. PLUM LANDING’s website, pbskids.org/plumlanding, is the online hub for all 30 animated videos forming the narrative of the series, which chronicles Plum’s visit to planet Earth. The videos include real-life explorations, activities and educational content focused on the environments that Plum and her human friends explore. The website includes nine games of exploration, creativity and scientific discovery, and nearly 100 galleries of missions where kids can create pictures and photographs to send to Plum for possible publication. The site, built in HTML5, is mobile and cross-platform accessible. Major funding is provided by the National Science Foundation, the Corporation for Public Broadcasting (CPB) and The Kendeda Fund. Additional funding is provided by the Northern Research Station, Forest Service and the U.S. Department of Agriculture. Images of PLUM LANDING and Plum’s Photo Hunt App can be found on PBS PressRoom. Parents can start exploring with the PLUM LANDING community on Facebook, Twitter, Tumblr, Pinterest and YouTube.